I had a small realisation last weekend when I went to Sri Vrindavan Dhama to attend the Govardhan Parikrama yatra of HH Gopal Krishna Goswami Maharaj. We, the whole family, reached Vrindavan on Friday evening. Surprisingly there wasn’t too much traffic on the roads so we reached fast, may be because it was a Friday or may be because it was `Karva Chauth’ (married women fast without even water for the long life of their husband, a popular festival in North India). As we entered the temple complex we could see the festive hustle and bustle. But as we entered the temple hall it was as if we have been transported to some magical place. There were hundreds of devotees inside, everyone offering ghee lamp to Lord Damodar. Everyone was patiently moving forward with their turn and offering ghee lamp. It was a divine sight to behold forever in my heart. After the deep daan, we had a hearty dinner prasadam at MVT (the main motivational factor for my kids to visit Vrindavan). My family returned back the same night where as I stayed back to attend the Govardhan parikrama the next morning. There was a small issue of my lodging as every single ashram in Vrindavan was completely booked. Anandini Radhika mataji, a kind hearted devotee from Gurgaon, had allowed me to stay at her apartment along with HG Krishnananda Prabhuji, who was staying there presently. Fortunately for me, I met HG Krishnananda Prabhuji in the temple itself and requested him to allow me to stay with him for a night in the same apartment. Prabhuji agreed but said that he was in fact staying in a Brahmachari ashram just outside the temple complex and invited me to stay with him as his servant as it will convenient to come to come in the morning. I was very happy to get a chance to get association of Prabhuji and heartily agreed. Prabhuji asked me to see him at 8.45pm outside Prabhupada quarters. As Prabhuji left a thought crossed my mind `I hope I don’t have to take a cold water bath at 4am in the Brahmachari ashram’! Prabhuji was there at sharp 8.45pm but there was a slight change in the plan. Prabhuji informed that now someone else will be staying with him tonight at the Brahmacharu ashram. He then introduced me to another devotee, a lawyer from Hyderabad, whose apartment, Prabhuji said, was also not too far from the temple. I reluctantly agreed, thinking I lost an opportunity to get Prabhuji’s association. While walking with that devotee to his apartment a thought crossed my mind that I am saved from an early morning cold water bath! As we walked back to his apartment, the devotee shared that he has not opened his apartment for 6 months and it is a little dusty. No problem, I thought, as long as the geyser works! We entered his apartment it was indeed full of dust. We cleaned apartment but the bathroom was a mess with a thick layer of dried mud which could not be cleaned with broom. I checked the taps, the water was on. I was also relieved to see a small instant geyser which switched on promptly at the press of a switch. But as I turned the lever for the warm water , no water came! It was Kaput! My heart sank. Anyway, we pulled some covers, made them into mattresses and had a sound sleep. In the morning with a heavy heart I entered the bathroom. Fortunately for me, the water was not too cold even at 4am. I then rushed to the temple to attend mangal arti. The temple hall was chock-a-block with devotees. I hurriedly took darshan and then went to meet devotees to leave for Govardhan. I will write about the Govardhan parikrama later but let me first share my experience with the warm water. I came back to Vrindavan from Govardhan prikrama around 4pm. After walking 21km barefoot I was very tired and had extremely sore feet. I desperately wanted a hot water shower. In no mood for another cold water bath, I called another devotee couple who had an apartment in Vrindavan and were supposed to have arrived by now. To my dismay I found that they were running late but fortunately the key for their apartment was available with their neighbour. As I looked forward to go there and get a good hot water shower I remembered that I need to first pick up my luggage from the apartment I stayed last evening. As I walked and reached that apartment I realised that I had simply no energy left in me to walk any more. So I decided to take a cold water shower there itself and take rest. Here is the interesting part. Next day morning, still tired and aching legs, but now I had no qualms about taking a cold water bath as by this time I was mentally tuned for a cold water bath. As I entered the bathroom somehow my eyes straight away went to the knobs below the geyser. As I turned it, the water started leaking from that knob. I found that the inlet to the geyser was turned off because it was leaking but… but the water did get warm and I could finally take a hot water bath, only when I had no desire left! So I got the little realisation that it was not good for me to fear from, or even think of , a cold water bath when Krishnananda Prabhuji offered to let me stay with him in the Brahmachari hostel. Then very smoothly and sweetly I was taught a lesson on how to keep my consciousness clean when I visit Vrindavan Dhama. And later when my desire for hot water bath went away then I got one! I thanked Dhama for teaching me this lesson, which I pray I should never forget. I also learnt that if we are conscious in Krishna consciousness then we can see the hand of Lord in our daily life. In contrast to the above experience, my visit to Govardhan got facilitated amazingly simply due to the mercy of Lord and His dear devotees. I just had a desire to take darshan of HH Gopal Krishna Goswami Maharaj since many days. Hence initially I thought it will be a good idea somehow reach Govinda Kunda at the same time when Maharaj is scheduled to give his lecture. But one after another things shaped in such a manner that I was able to reach Vrindavan a day before, next morning leave in a car which trailed Maharaj’s car from Vrindavan to Govardhan and then start the parikrama with maharaj and other senior devotees. So due to a small desire to take darshan of Maharaj I received his mercy of being able to perform Govardhan Parikrama that too following his lotus feet. The Govardhan parikrama itself was all bliss. The weather was perfect and more perfect was the esteem association I received, apart from Sri Giri Govardhan. 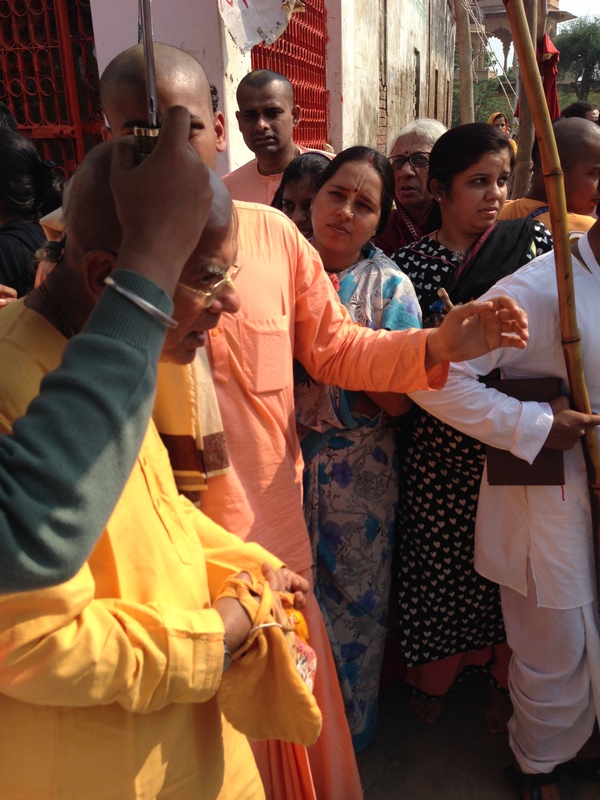 I was fortunate to do most of the parikrama walking behind HH Gopal Krishna Goswami Maharaj. I was also very fortunate to receive his merciful glance and greeting during the yatra as maharaj inquired me how was I doing. I also meet HG Rukmini Prabhuji after a long gap and so many other senior devotees from Delhi. It was amazing to see HH Gopal Krishna Goswami Maharaj walking with so much energy in his steps despite all the health issues with his body. When I shared the same, Anand Chaitanya Prabhuji, replied that Maharaj is doing the yatra for us. He shared how he did not feel up to the mark to undertake Govardhan parikrama but his wife pushed him that if Maharaj could do it at his age and with such health problems then why can’t he do it? Prabhuji said that he had no answer for it and decided to join the yatra. This point was further proved when, during the prasadam break, Maharaj asked how many devotees are coming for the first time to do the parikrama, more than 50% devotees raised their hands! Here are some pictures from the yatra which culminated at Sri Radha Kund. All glories to HH Gopal Krishna Goswami Maharaj. All glories to Giri Govardhan.